NYAPRS News: We’re only 3 weeks away from this year’s NYAPRS Annual Conference, “Dignity, Recovery and Justice for All!”, to be held on September 12-14 at our new site at the Honor’s Haven Resort in Ellenville! While we’re still making some adjustments to the program this week, you can see the basic schedule below, via the attachment or at this 2018 Annual Conference Preliminary Program web-link. 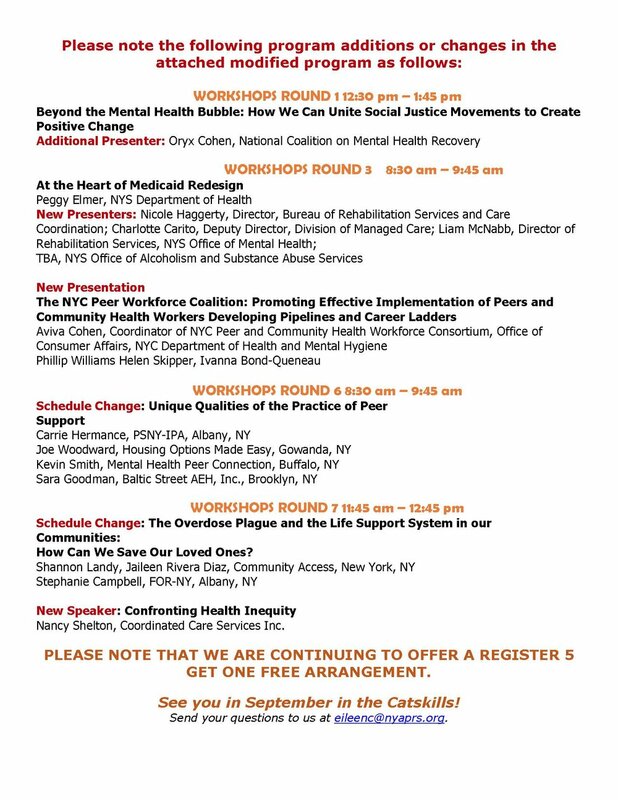 This year’s program features some of the nation’s and state’s most prominent experts in peer services, including fidelity standards, specialized vet to vet models, the impact of Medicaid and managed care, outcome and evaluation tools, supervision and certification, peer services’ boundless reach and peer support principles’ and practices’ impact as a system and social change agent. Register today! Vet to Vet: Thank You for Your Service! Why do We Put Boundaries around Peer Support? Peer Supervision: What’s Working, How and Why? New Site: Please note that we have moved the conference to the lovely Honors Haven Resort in Ellenville, which has previously served as the overflow site for the nearby Hudson Valley Resort. Folks can still choose to stay at the Hudson Valley Resort and take the shuttle to the Honors Haven or participate as a commuter if choosing to stay at another hotel. See the registration form for more details. First Come First Served! : Please Register Now! or at https://rms.nyaprs.org/event/?page=CiviCRM&q=civicrm/event/register&id=28&reset=1 if you prefer to stay at the Honors Haven as the room capacity is limited. See you in September in the Catskills! 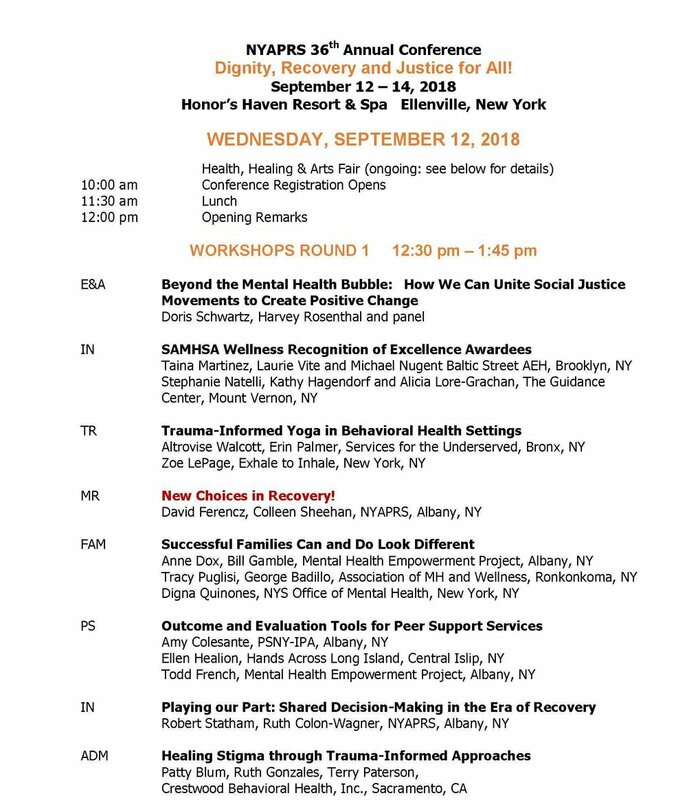 NYAPRS News: We’re only 3 weeks away from this year’s NYAPRS Annual Conference, “Dignity, Recovery and Social Justice for All!”, to be held on September 12-14 at our new site at the Honor’s Haven Resort in Ellenville! While we’re still making some adjustments to the program this week, you can see the basic schedule below, via the attachment or at this 2018 Annual Conference Preliminary Program web-link. This year’s program will draw from the inspiration, enthusiasm and expertise of over a 100 presenters from across the state and nation via upwards of 70 very timely and energizing presentations, keynotes and special events. We’re very grateful to all of them and to everyone who submitted an application. This year, we’re pleased to welcome presenters from California, Virginia, Tennessee, Georgia, New Hampshire, Wisconsin, Arizona, Connecticut, Colorado, Florida, New Jersey and Kansas. NYAPRS News: We’re only one month away from this year’s NYAPRS Annual Conference, “Dignity, Recovery and Social Justice for All!”, to be held on September 12-14 at our new site at the Honor’s Haven Resort in Ellenville! 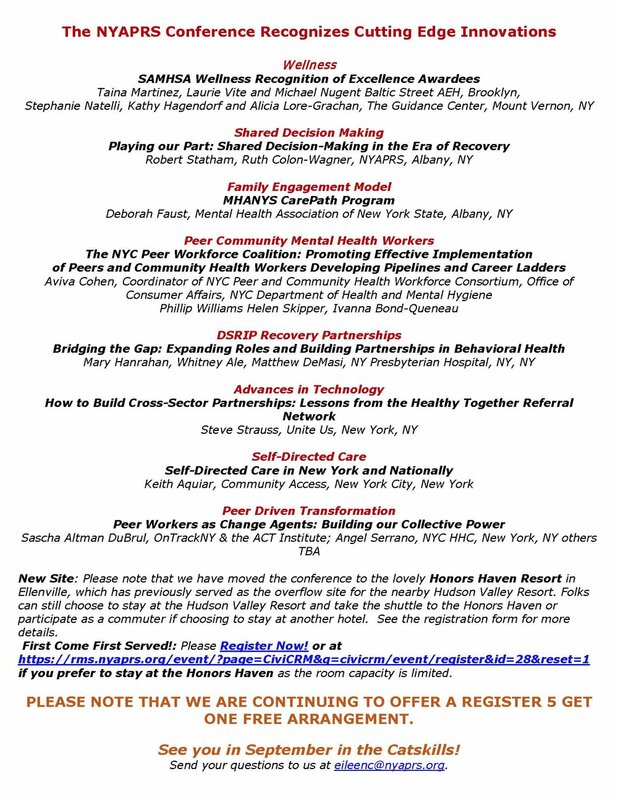 NYAPRS News: We’re only one month away from this year’s NYAPRS Annual Conference, “Dignity, Recovery and Social Justice for All!”, to be held on September 12-14 at our new site at the Honor’s Haven Resort in Ellenville! While we’re making some adjustments to the program this week, you can see the basic program below, via the attachment or at this 2018 Annual Conference Preliminary Program web-link. NYAPRS Conference Program Out This Week: Cochran, Armstrong Join Pat Deegan; Register Today! NYAPRS News: The NYAPRS Conference is only 5 weeks away, to be held September 12-14 at our new site at the Honor’s Haven Resort in Ellenville! Joining pioneer Pat Deegan will be historic innovators Moe Armstrong, founder of the historic Vet to Vet model of peer support and Sam Cochran the major developer of the Crisis Intervention Team model. All 3 will be offering their unique insight on where we’ve been and should be going. 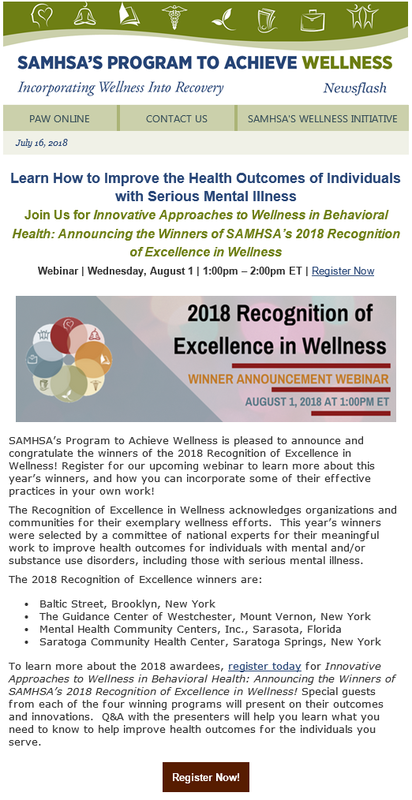 The program will also offer a first inside look at two New York State program models at Baltic Street AEH and the Guidance Center that were just recognized a few weeks ago by SAMHSA for their innovative contributions to promoting wellness and employment. We’re also very pleased to offer a panel of 3 of the nation’s most experienced peer service leaders in the areas of Medicaid and managed care: Sherry Jenkins-Tucker, Georgia Mental Health Consumer Network, Anthony Fox, Tennessee Mental Health Consumers’ Association and Elise Padilla, Star Center. And of course, David Granirer will be back once more with another group of budding comedians for our Thursday ‘Stand Up for Mental Health!’ program. PLEASE BE ON THE LOOKOUT: OUR FULL PROGRAM AND PRESENTATIONS SCHEDULE WILL BE GOING OUT THIS WEEK! First Come First Served! : Please REGISTER EARLY if you are interested in staying at Honors Haven as the room capacity is limited. Once filled, participants will be notified and may stay at the Hudson Valley or as a commuter if choosing to stay at another hotel. Click the link for a closer look at the Honors Haven Resort, Conference Registration and accommodation details forms https://rms.nyaprs.org/event/?page=CiviCRM&q=civicrm/event/info&reset=1&id=28 Register Now! NYAPRS News: The link for NYAPRS Annual Conference is up and open for business! NYAPRS Annual Conference, to be held September 12-14 at a new site this year at the Honor’s Haven Resort in Ellenville. The Honor’s Haven, which has long been a very popular alternative site to the nearby Hudson Valley Resort, will allow us to offer all of the special events and atmosphere that thousands have loved for so long and much more, in the same Catskills Mountain environment and for the same one-price-for-all arrangement. This year’s theme, “Dignity, Recovery and Social Justice for All” reflects the key values and aims of our ever expanding community. It seeks to underscore that, ultimately, there can be no full recovery without achieving both a personal sense of dignity and an explicit commitment to address the injustices of all forms of discrimination, poverty, racism, criminalization, hunger and homelessness. We are proud to announce that Pat Deegan, who coined the term ‘the dignity of risk’ almost 2 decades ago, will be a featured keynote speaker in an ever growing lineup of inspiring thought and innovation leaders that will include Leah Harris, Chacku Mathai and Sacha Altman duBrul and will once more bring back our hilarious and touching Stand Up for Mental health comedy show. Please register early if you are interested in staying at Honors Haven as the room capacity is limited. Once filled, participants will be notified and may stay at the Hudson Valley or as a commuter if choosing to stay at another hotel. Click the link for a closer look at the Honors Haven Resort, Conference Registration and accommodation details forms https://rms.nyaprs.org/event/?page=CiviCRM&q=civicrm/event/info&reset=1&id=28 Register Now! The Most Overlooked Social Determinant of Health! NYAPRS Note: The literature is clear: for far too long, racism has been the most prominently missing social determinant of health and the impact is enormous in terms of healthcare outcomes and costs and, most strikingly, in terms of life and mortality. Racism costs! “Eliminating health disparities for minorities would have reduced direct medical care expenditures by $229.4 billion for the years 2003-2006” in the US. NYAPRS and our partners at the McSilver Institute and CCSI have joined forces to create a learning experience unlike any other in our nation, one that makes addressing the impact of racism and examining strategies to overcome it the sole focus of next week’s Albany based special event! Our event offers the chance to hear one of the nation’s most prominent experts in this area, Dr. Ruth Shim from the University of California, Davis. Don’t miss out on this important and stimulating one day event! 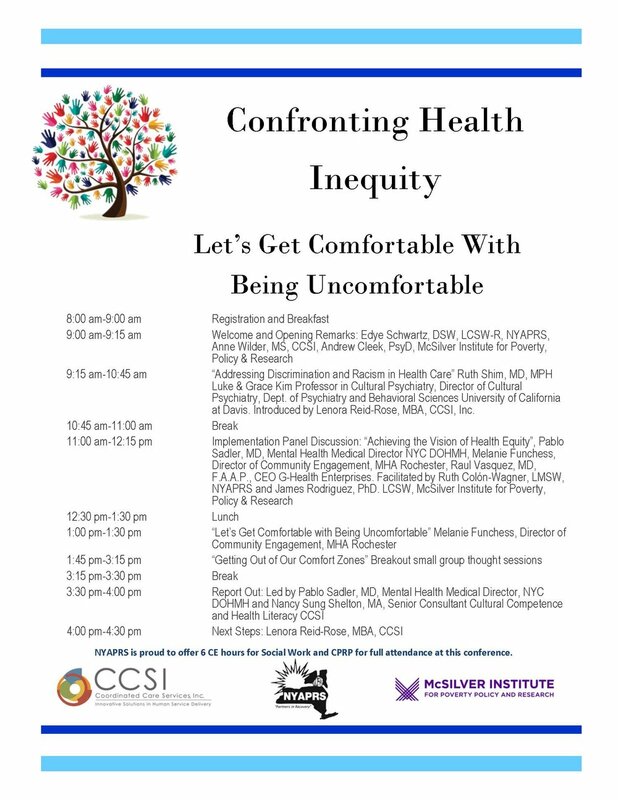 There is still time to register for next week’s health inequities event in Albany! 6 hours of CEU’s available for CPRP and NYS SW!